Jill Meeks serves as a Senior Sales & Leasing Executive and Property Manager at Stirling Properties. Prior to joining Stirling in 2014, Mrs. Meeks served as Vice President of John Toomey & Company for twenty one years. She was instrumental in the development of the company through acquisitions, sales and leasing. Mrs. Meeks began her career in Commercial Real Estate at Roberts Brothers, Inc. She worked for two years in their Commercial Department before joining Lyon Properties, Inc. to work with Mr. Billy Lyon and Mr. John Toomey. Mrs. Meeks worked there for four years before Mr. Toomey opened his own company, and hired Mrs. Meeks as his Vice President. The focal point of her work has been in the areas of Office and Retail Leasing, Commercial Sales, and Landlord and Tenant Representation. Mrs. Meeks is responsible for overseeing the Property Management of office and retail space in Mobile and Baldwin Counties. 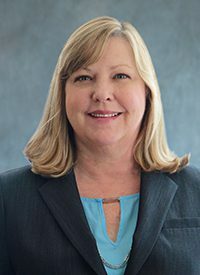 Mrs. Meeks is an active member of the Mobile Commercial Real Estate Exchange group, and she serves as the 2017 President of this organization. She was awarded the Silver Award at Stirling Properties for transactions closed during the year of 2016.